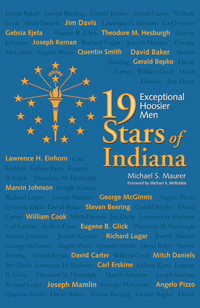 The 19 outstanding contemporary Hoosier men profiled by Michael S. Maurer—one for each star in the Indiana state flag—are leaders and pioneers who have excelled in a variety of pursuits, including law, business, philanthropy, government, medicine, music, art, athletics, religion, and education. Among the inspiring life stories are those of Hoosiers shot out of a fighter jet, liberating a concentration camp, subjected to court martial, knocked cold in front of 20,000 fans, facing bigotry, and caught in the middle of ethnic slaughter—lives full of excitement, adventure and achievement. Men and women of every generation will enjoy their stories.